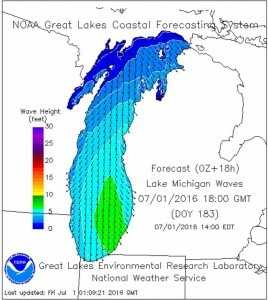 GREAT LAKES, USA – The Great Lakes Surf Rescue Project (GLSRP) is issuing a Dangerous Currents warning for the start of the 4th of July Holiday Weekend. I agree with it about 99%. 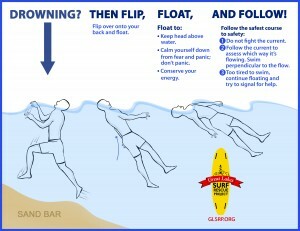 And I advocate the “Flip, Float, and Follow” Drowning Survival Technique. DON’T PANIC – If caught in a current or any drowning situation, it is important to know, “Don’t Panic,” because panic can kill you with poor choices or reactions to the event, but ‘don’t panic’ isn’t necessarily a strategy or an action to take to survive. Panic is an emotional and irrational response to a situation or circumstance. SWIM – Swim is an action, but it’s an action to exert your energy. In a drowning situation, it’s a marathon for your life (a marathon very few have trained for) and you want to conserve your energy and pace yourself (you wouldn’t sprint a marathon, would you? No. You would train, diet, and pace yourself.). SWIM PARALLEL – And Swim Parallel… exert your energy possibly in the wrong direction against the current. 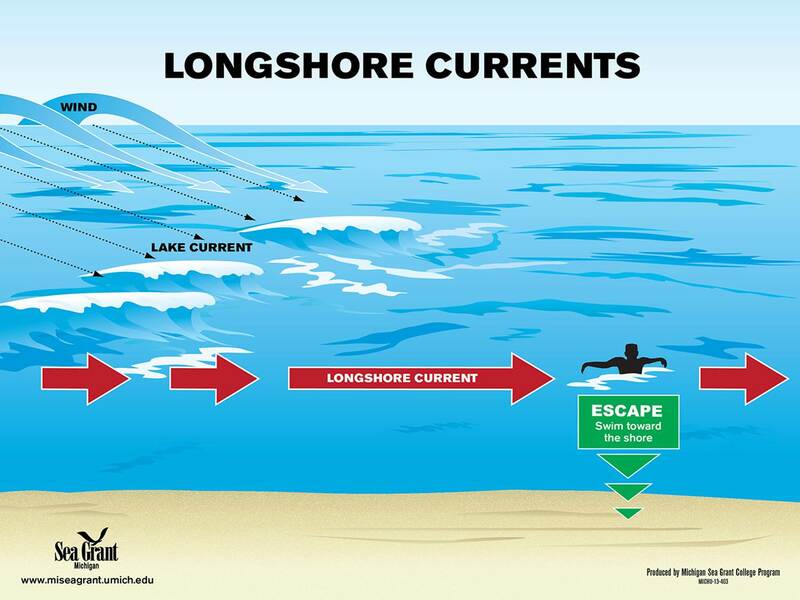 See… rip currents are usually not ‘perfect perpendicular’ to shore. And once a rip current pulls out past the sandbar, it can mushroom out and even change directions. So if your first instinct in a rip current is to exert your energy possibly in the wrong direction, you’re likely going to drown. Why are you likely going to drown? Because once a person exerts all of his/her energy in water, they go vertical and do the Instinctive Drowning Response (facing shore, mouth at water level, head tilted back, hyperventilating and gasping for air, and doing a ‘climbing the ladder motion’). And when someone is doing the Instinctive Drowning Response, its usually less than 60 seconds till final submersion and gravity pulls them under. 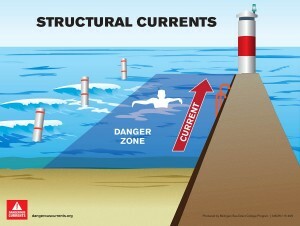 In addition, a rip current is just one type of “Dangerous Current” that exists when there are waves. 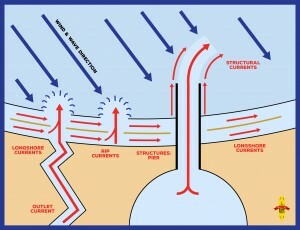 There are also Lonshore Currents and Structural Currents. 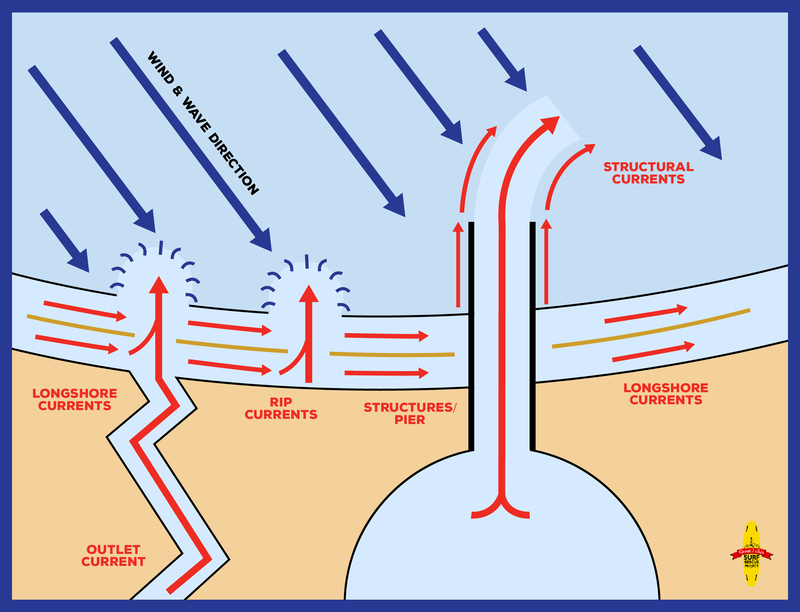 It’s important to know that Longshore Currents typically flow parallel to shore and Structural Currents flow parallel to the structure. So you’re drowning. You’re panicking, You’re fighting for your life. It’s a confusing ordeal. You have a limited point of view from the surface of the water in the waves and may not be able to tell which way the current is pulling you. You’re thinking, I’m in a rip current. I have to swim parallel. But the Longshore and the Structural currents pull parallel to the land mass. Again, you have a chance of swimming (aka exerting all of your energy) against the current. It’s best to stop drowning for a moment, and Flip, Float, and Follow. Flip over onto your back and float. Float to keep your head above water. Float to calm yourself down from the panic and fear of drowning. Float to conserve your energy. Follow the safest course to safety: Never swim against a current. 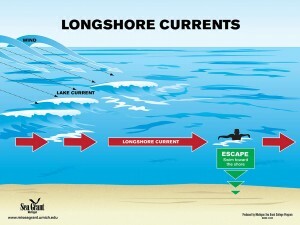 If you are in a Dangerous Current, assess which way it is pulling you. Then swim perpendicular to the currents flow until you are out of it and then swim toward shore. 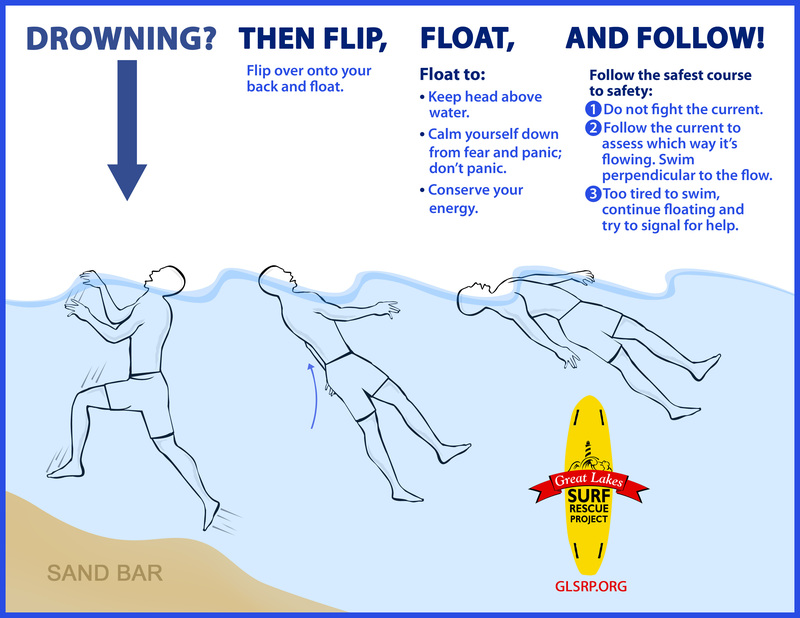 If you are too tired to swim to shore, continue to float and signal someone on shore for help. Also, the waves may eventually bring you back to shore. –As long as you are floating, you are alive. The Longer you are floating the more time you are buying for rescue to arrive. –As long as you are struggling or fighting the current, you are drowning – Conserve your energy and do not do the Signs of Drowning. The Great Lakes Surf Rescue Project, Inc. (GLSRP) is about saving lives. It is a nonprofit 501c3 corporation that is a Chapter of the National Drowning Prevention Alliance (NDPA). Works with family and friends of Great Lakes drowning victims to advocate water safety. Mission: To eradicate drownings by being the leader of Great Lakes water safety by providing training, public preparedness, and public awareness. Vision: Everyone in the Great Lakes region, nationwide and worldwide, is knowledgeable, engaged and proactive in water safety with an emphasis on the Great Lakes region. John & Kathy Kocher’s “Gentle Giant” ‘Because I said I would promise video.